iPhone car kits professionally fitted in Leeds, Huddersfield, Wakefield, Harrogate, and Bradford. Our mobile fitting team offer onsite service to install your iPhone hands free throughout West Yorkshire. Choose from models like the Parrot CK3100, a Simple Bluetooth hands free kit with no music functions but excellent hands free. includes a screen which allows you to see who’s calling and dial from your iPhone contacts.Or the Parrot MKi9200, Parrot’s top of the line kit is the Mki9200 system. This kit was designed for the iPod and iPhone, and will play all of your music through the car hi-fi, allowing you to see the album art on the detachable screen, while your iPhone is safely charging in the glove box.You can make and receive calls to any of your phonebook’s contacts with one touch of the control button and voice commands. 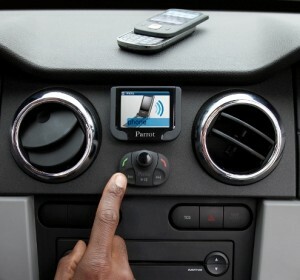 You can see a full list of Parrot bluetooth hands free car systems by clicking here. Mac Repair Ltd are proud to recommend Camelectric Ltd . They are based in Huddersfield, and cover a large geographical area around West Yorkshire. They always willing to undertake out of area Corporate and Multi Site work and can arrange additional labour if necessary through our network of network approved engineers. Cam Electric is your one stop for lots of extras for your car or van.